Plush Robot Josef available for pre-ordering! Amanita Design forum > Machinarium > General Machinarium topics > Plush Robot Josef available for pre-ordering! 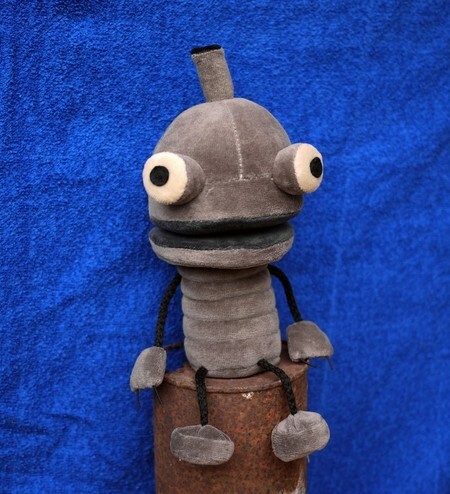 You can finally pre-order our plush friend Robot Josef, proud citizen of Machinarium. The first batch of 100 pieces is ready and more robots will be available soon. Re: Plush Robot Josef available for pre-ordering! My daughters wants this, I will be placing my order on Friday. I got one of these plush's and they are brilliant but I wondered if you would consider making a plush of Josef's girlfreind to go with him? This photo was posted on Amanita Design's Facebook page on October 21, 2013! Berta & Josef Plush Toys are now available at Amanita Design merchandise store! Josef and Berta. United. At last. Also I did message Tomas to change the "Bera" typo on the Amanita store. Did anyone else notice it? It would be great if there was a solar wobbling Josef, like the solar flowers that go on windowsills!